Using DD's computer 'cause still no joy in internet land!! I can't believe we're still without internet, but we are. In the meantime, I've got ttwo cards made using JessicaLynn Original stamps. 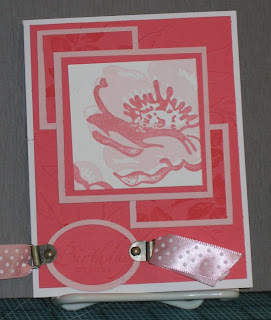 This is the first of my projects for 2009 as part of the design team for JessicaLynn Original Stamps. I was very pleased to receive the Rainbow Bridge set and wanted to use that one first. The colours I selected for this card were taken from a most unusual place. DH and I were watching The Late Show with David Letterman one evening and I just loved his tie. He is always so impeccably dressed and wears the most beautiful ties. Anyway, that’s were the inspiration for these colours were found. Now, onto the card. Although you can’t tell, the base of the card is Very Vanilla. The other two cardstocks are Lovely Lilac and Creamy Caramel. 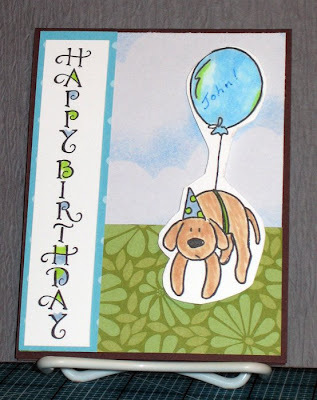 As you can see, I used my Cuttlebug extensively for this card, making two of every thing. I first used the Branches with Birds for the first layer. The circles are both large and small Straight and Scalloped. The smallest circle is for the image and uses, of course, Very Vanilla. I stamped the image using Palette Hybrid Black ink and coloured it with Copic markers. If you look closely, you may be able to see the ever-so lightly sponged area for which I used Brilliance ink in Pearlescent Sky Blue. As a final touch, I added some Glamour Dust to the rainbow for a little pizzazz. 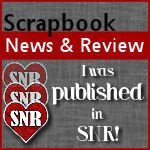 Here is another great stamp set by JessicaLynnOriginal. Jessica really comes up with some of the cutest designs I’ve seen and this set is no exception. When I looked at this stamp, which is one of four, along with some accessory stamps in the set, it just made me think that this fellow was checking himself out in the mirror before picking up his date for the evening. He looks in the mirror and thinks, “Stripes are so Slimming!” and off he goes, full of vim and vigor for a night out on the town. On this card I started with Creamy Caramel. The striped paper is by SU from last year. (I’ve got to use it up or I can’t buy more!) I used the Nestabilities Labels 2, the largest and the one two steps down from that. I wanted a wide border to show off the stripes. The image was stamped onto PTI Select White and the ink is Memento Tuxedo Black. It’s the first time I’ve used Memento ink and I’m happily surprised with the crispness of the image. And, also in it’s favour, it does not bleed when using Copic markers. It’s a winner! The sentiment is from a grab bag of stamps I purchased last year from an unknown source. 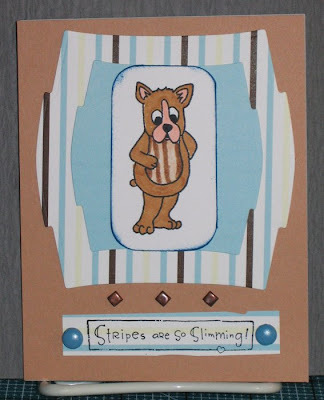 I stamped it on more of the striped paper, going in a horizontal direction and added a couple of brads at each end. Still thinking it needed something, I opted for small square brads to add between the image and the sentiment. I’m happy with the way it looks. We are changing internet service providers and I expect there will be some downtime over the next few days. In the meantime, here's a little video I took of my grandson. He's using his aunt's iPod, listening and dancing to Beyonce. Jackson is 2-1/2 and is totally in love with Beyonce. I think he may be her youngest fan! He even asked me last week, and these are his exact words, "Grandma, do you have Beyonce in this car?". Sadly, I had to say no. Enjoy the video. John is very thankful for all the wonderful comments he received on his birthday. He can't believe how many people wanted to wish him well and, he also loves to tell me that he's getting more comments than I do! Well, honey, whatever makes you happy is alright by me. But now we return to the regularly scheduled programming. I really liked the colours selected for CC205 last Tuesday, but it took me a couple of days to sit down and make my card. I completed it yesterday and wanted to share it with you today. The colours, Pink Pirouette, Kiwi Kiss and Perfect Plum look fabulous together. 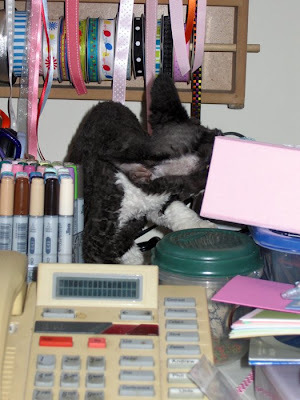 As you can see, the base is Pirouette Pink and to each side, I added a strip of SU's DP to bring in the Kiwi Kiss. I used my Nestabilities - Labels 2 and embossed and cut three different sizes in the colours of the day. I used a Paperbag Studio stamp for the sentiment which is stamped in Elegant Eggplant ink. On the brads, I used Copic markers to enhance the colours and, if you look closely, you will see that it has given the brads a marble effect. Click on the photo for a larger view and you will be able to see the marble effect better. If I had an SLR camera, I would have taken a close up for you, but, alas, I don't. The flowers are from my stash, too. This is another card for the February birthdays. Tomorrow the kids and grandkids and my sister are coming over for a birthday celebration and we'll have lots of cake and ice cream then. In the meantime, I wish you all a Happy Valentine's Day. Today GrampaStamper (a.k.a. John, DH, Honey...etc.) is another year older and, perhaps, another year wiser, but I'm not sure about that. 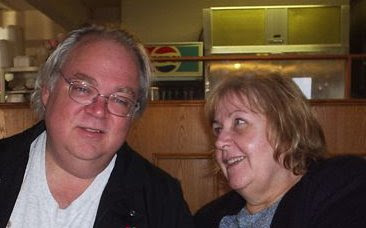 This is the man who sometimes hijacks my blog, this is the man who kept you all updated when I had my knee surgery, this is the man who makes me laugh daily and, last, but not least, this is the man I love. We have a new little fur-baby! His name is Burt and already he wants to know if I've scrapped any pictures of him yet! 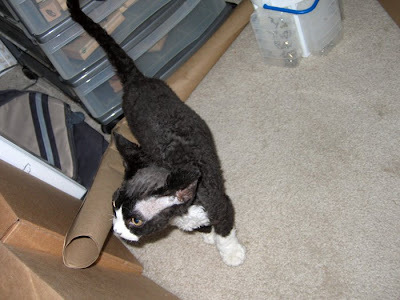 He arrived on Friday afternoon and spent most of Friday evening and Saturday hiding. 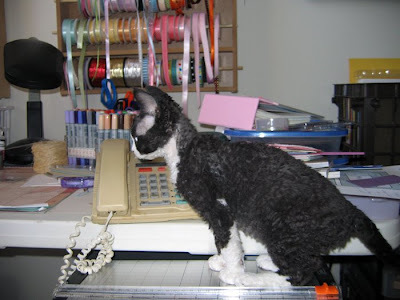 This morning (Sunday), he decided he wanted to explore more so I opened up my craft room door. Here's a couple more pics for your viewing pleasure. 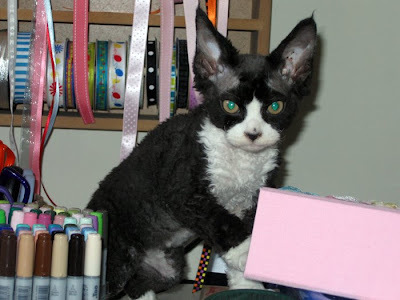 He's a Devon Rex pure-bred cat. I have allergies so that's why we chose this breed. DH is in love with him, as am I, from the moment we first picked him up. He's quite the character already. Stay tuned as I'm sure I'll have all sorts of stories in the days and weeks to come. That's what I named this little darling. Someone needed an 'angel' for an ATC swap over at The Stamp Shack, so I took the spot. All the stars must have been aligned today because creating this ATC took about 20 minutes, start to finish. Don't you just love it when what's in the mind translates to paper and ink without any trouble at all? I felt so lucky I bought Lottery tickets today! Once again, last year's DP by SU was used, along with my Scalloped Rectangles, small, which I used to create a window. 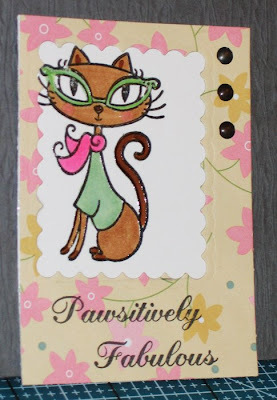 The kitty and sentiment are by Pink Cat Studio. The brads were the finishing touch and the swap will be on its way tomorrow morning. I'm off to watch Jeopardy now. DH is waiting for his nightly 'beating'. ....I had to make a card using pink and orange. I thought both girls looked stunning, but Sasha is just so sweet. With all the February birthdays, I knew if I made a card for a female, it would go to someone special. I can't say who it's for, just in case they read my blog (not likely, though). The base is white and then I used some SU designer paper from last year (gasp! 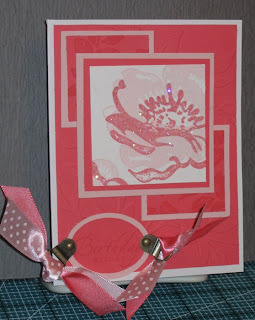 )and ran it through the Cuttlebug using the Circles & Dots embossing folder. I discovered this only has benefits if you do not then cover up almost the entire card front! I then used Labels 2 from Nestabilities and used the negative bits to make a frame so that it looks like Hanna is inside a window....window shopping....get it!! Sorry, too much coffee already. 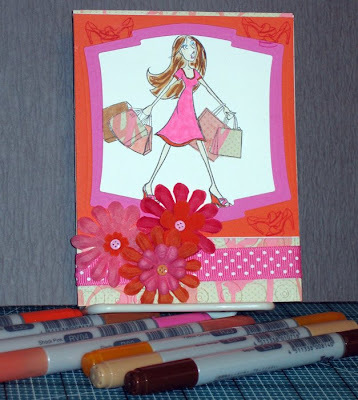 The coloured cardstock is Pixie Pink and Only Orange. I did some paper piecing on three the bags she's carrying. There's definitely a lot of different things going on with this card. I coloured the image with Copic markers. 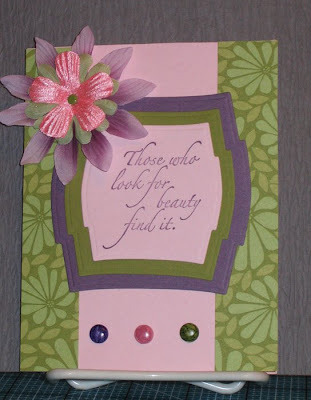 As a sidebar, I'm going to attend a class taught, by Nicky, at Stamping Bella on February 25th. Any ladies in the Toronto area should check out the calendar to read about it and other classes, too. To complete the card, I added Primas with centres by Maya Road flowers and little, bitty button brads and some hot pink dotted ribbon. Okay, that's my card for this morning. I'm feeling crafty so maybe I'll do another later today as I have to be at home awaiting delivery of a new coffee pot. Same layout as post below....different occasion! As previously noted in the post below, I love this layout. I made it a birthday card this time. In fact, I did the card and took the photo. The more I looked at it, the more I thought it was missing something. The top card was the first go round. Just a few minutes ago, I took that card, added some Glamour Dust and re-tied the ribbon, this time using two colours of ribbon, Sweet Blush Swiss Dots and Berry Sorbet Silk ribbon. Personally, I think it made a huge difference. 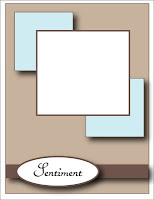 The entire card uses only these two colours, both in cardstock and ink, except for the card base which is plain white. Tell me which one you prefer. P.S. If you click on the photo, it will open a new window and you can actually see them much better, including the sparkle on the lower card. This is my entry for the sketch challenge goin' on over at Little Paper Shop. 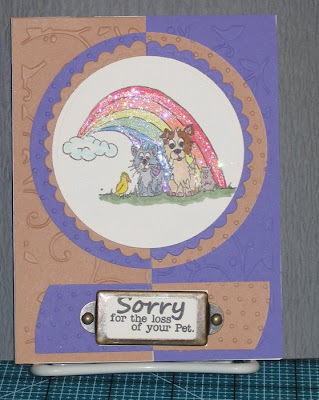 I think the Flourishes stamp set hits the mark for Sympathy cards. I'm almost certain that the card base is Vintage Violet. It was a piece of left over c/s that was in my scrap drawer. Onto the base, I placed a piece of gray, textured paper. You can just barely make out that it is textured in the photo, if you look closely. The main image was stamped onto Pure Luxury white c/s and I used Smoky Plum ink by CTMH. I loaded up the stamp with lots of colour and stamped it once, then, without re-inking, stamped it twice more. This actually happened by accident as I was testing the amount of ink on a scrap piece and was too lazy to clean the stamp so I just stamped it again and again to clean the stamp the lazy man's way. Lo and behold, it made me think of a person's soul winging it's way to Heaven! I mounted the white piece to a 2" x 2" bit of Elegant Eggplant. The smaller squares were cut from Elegant Eggplant and Vintage Violet and stamped with one of the smaller flourishes from the same set. 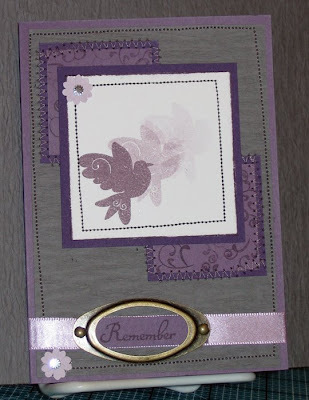 The sentiment, also from Flourishes, was stamped onto som Vintage Violet and then I put it onto some Lavender Moon ribbon by PTI and surrounded it with some hardware from Hodge Podge by SU. The little flowers were strategically placed to secure the threads left by the stitching. I really like the way this card turned out. Unfortunately, I know that I will have to use it one day, hopefully not too soon. This is the sketch we were to follow and I thought it was fantastic. In fact, I'm going to make another card today for an upcoming birthday for a special person. Thanks, LPS, for a great sketch and the opportunity to win Flyin' By. It's much appreciated.